Arik Air is a Nigerian airline operating a domestic, regional and international flight network. It operates mainly from two hubs at Murtala Muhammed International Airport, Ikeja and Nnamdi Azikiwe International Airport, Abuja. Arik Air's head office is the Arik Air Aviation Center on the grounds of Murtala Muhammed International Airport in Ikeja. On 3 April 2006, Arik Air took over the former Nigeria Airways facilities in Lagos, some three years after its liquidation, and began reconstruction work. On 14 June 2006, Arik took delivery of 2 new Bombardier CRJ-900 aircraft to fly domestic routes throughout Nigeria and, within the African continent from Summer 2006, 2 ex-United Airlines Boeing 737–300s and 3 50 seat Bombardier CRJ-200 aircraft. In August 2006, the Federal Ministry of Aviation granted Arik Air authorisation to fly to Trinidad and Tobago and Amsterdam, London and Madrid in Europe. Furthermore, the airline then planned to fly to Atlanta, Miami, and Houston in the United States and Birmingham in the United Kingdom. On 30 October 2006, Arik Air began scheduled passenger flights with four flights between Lagos and Abuja using CRJ 900 aircraft. Flight operations began to Calabar on 15 November 2006 and services to Benin City and Enugu started on 7 January 2007. The airline is wholly owned by Ojemai Investments. The Nigerian government set a deadline of 30 April 2007 for all airlines operating in the country to re-capitalise or be grounded in an effort to ensure better services and safety. The airline satisfied the Nigerian Civil Aviation Authority (NCAA)’s criteria in terms of re-capitalisation and was re-registered for operation. On 4 April 2008, Arik Air was given permission to fly to the United States by the US Department of Transportation. Arik Air started international operations to London-Heathrow on 15 December 2008, using an Airbus A340-500 aircraft damp-leased from Hi Fly. It added Johannesburg on 1 June 2009, New York JFK on 30 November 2009, and Dubai on 28 July 2014. Subsidiary airline Arik Niger (IATA code: Q9) commenced operations in April 2009, but was shut down in February 2010. Arik Air transported its 5 millionth passenger on 6 August 2010 and it transported its 10 millionth passenger on 18 September 2012, both on flights between Johannesburg and Lagos. On 20 September 2012, the airline cancelled all its domestic operations after aviation officials raided the airline's office in Lagos, Nigeria. Flights resumed on 23 September. Arik Air had placed an order for five Boeing 777-300ER aircraft, which was cancelled in 2011. Rumours have spread that Arik Air converted an order for two Boeing 747-8I aircraft back into an order for two 777-300ERs in 2013, however, no such cancellation has materialised, nor was the order of two 777-300ER aircraft confirmed by Boeing. The order for 2 747-8I aircraft still stands and is still listed by the Boeing company. Arik Air has built up a strong domestic network. It covers mainly Nigerian and several other Western African destinations. 1 2 "Directory: World Airlines". Flight International. 27 March 2007. p. 77. ↑ "New aircraft to make arik air the largest commercial carrier in nigeria arik air reflects on six months of flying “the new experience”." Arik Air. 28 March 2007. Archived from Retrieved on 8 September 2010. "For more information, please contact: Gbemiga Ogunieye, Head of Communications, Arik Air Ltd, Arik Air Aviation Centre, Murtula Muhammed Domestic Airport, PO Box 10468, Ikeja, Lagos, Nigeria." ↑ "About Arik Air." Arik Air. 15 June 2006. Retrieved on 3 December 2010. ↑ "Notice of Action Taken re: Arik Air Limited". U.S. Department of Transportation. 4 April 2008. ↑ "Arik Air's First Flight to London Heathrow a Success". Arik Air. 15 December 2008. Retrieved 28 November 2011. ↑ Arik Air arrives in Johannesburg, Arik Air, 2 June 2009. Retrieved 27 November 2011. ↑ "Arik Air reaches milestone carrying 5 millionth passenger during summer period". African Aviation. 10 September 2010. Archived from the original on 8 October 2011. Retrieved 9 October 2011. ↑ "Nigeria's Arik Air cancels domestic flights". BBC News. 20 September 2012. Retrieved 22 September 2012. 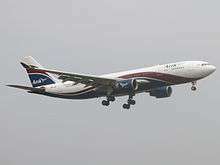 ↑ "Nigeria's Arik Air resumes flight operations today". Nigeria Vanguard. 23 September 2012. Retrieved 23 September 2012. ↑ "Our Fleet". Arik Air. Retrieved 19 September 2014.